Oops, they did it again. Our friend Google caused a panicked rumble through the tech world late Monday afternoon, when they announced they’d be restructuring under a new holding company called Alphabet. Never mind that this is something companies do all the time. Never mind that there’s no reason to think it will change what’s happening with search in any way. Never mind the weird, April-Fools-looking new domain. What will this do to my rankings? Why the collective jumping at shadows? 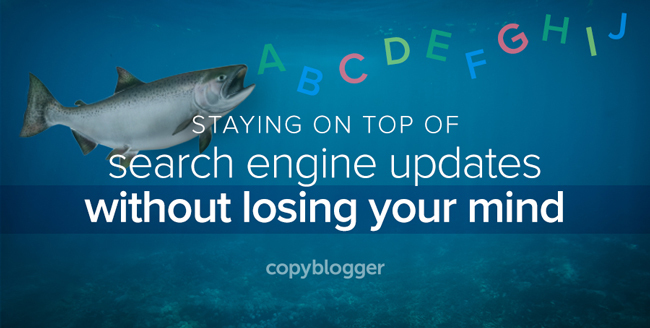 Well, because if your business depends on your search rankings — and we’ll talk about that in a minute — you probably have a certain amount of Google-induced stress disorder. Key elements change. Abruptly. And secretly. And you’re left scrambling to pick up the mess. And to be honest, it can get right on your last nerve. But if it causes you more than a few moments of irritation, you may benefit from shifting the way you think about the web’s favorite 800-pound gorilla. Here’s how I’ve learned to think about Google (courtesy of advice from Copyblogger’s founder, Brian Clark). Which means when they pull stunts like this — and they do, with some regularity — my pain is limited to a few curse words and some moderate tweaking. I have five rules for keeping my sanity when dealing with Google. Any time you use a tool from Google (or from any third party you have no control over), this question will help you. Sooner rather than later, ask yourself what your backup plan is — if and when the tool (or your search ranking, for that matter) dissolves overnight. You’ll notice that Brian asked and answered this question publicly about the Authorship program way back in April, 2013 — making us all look like Big Damn Heroes when Authorship did, in fact, blow up. Did we think that would happen? Actually, we didn’t. Were we prepared when it did? You know it. Ask yourself right now what you’ll do if Facebook disappears tomorrow, or Twitter, or your Google search results position, or your pay-per-click campaign. When tools and programs disappear in the online world, they often do so literally overnight. You need a solid plan in place for when that happens. Ranking in the search engines is not a civil right. You don’t “deserve” to have your content found by Google. (Or Bing, or Yahoo, or anywhere else.) That’s not a service that Google has promised you. Weirdly enough, Google won’t even promise you that they’ll accept large amounts of your money to run advertising on their AdWords platform. They can take that away any time as well. Without necessarily giving you a reason. Too often, we think that because we put a ton of work into being found on the search engines, that we are somehow entitled to that juicy position on the results page. It doesn’t work that way. The greater your sense of entitlement about what companies like Google owe you, the more frustration and anger you’ll feel when you get smacked. Which you will, if you’re in the game long enough. You also don’t work for Google. They don’t send you a paycheck or have you under contract. Whether or not you want to abide by their thoughts on best practices is completely up to you — and you should make that decision like an adult, weighing the pros and cons and keeping Google in its proper perspective. Spending hours picking apart every syllable Matt Cutts may utter, trying to understand what he thinks the definition of is is, and making violent changes to your business model because Cutts mentioned he likes or doesn’t like something, is a sucker bet. Refer back to Rule #2. It doesn’t matter how many hoops you jump through. Whether or not you do everything “the way Google wants,” (which you usually have to guess at, because they have no interest in telling you), they don’t owe you that search result. As I’m fond of saying, Google is a lot like that really mean girl from high school. Your best shot at getting her to like you is to ignore her while you go about getting social sharing, links, and publicity because you’re trying to reach people. The less you care about what she thinks, the better light she tends to see you in — because real people already like you. None of this is to say that having a good search result isn’t helpful. It can be, especially for some topics and business models. We earlier recommended including the Authorship markup on content because it was quick and easy to do with Genesis, and the potential looked promising. All of our SEO recommendations work that way. If you can tweak your content without messing it up for your human readers, and without putting every hour of your day into it, go ahead and do that. Use a few simple tools that will let you get your content optimized efficiently. And if your company has the resources to hire a strong team that devotes all of its time to search, that’s fine as well. But don’t do it if you can’t genuinely afford it, and don’t do it if you can’t weather the inevitable storms. Recognize that search is a long game. Put it in its proper place. Use other ways to connect with and engage your audience. And if a great search placement shows up over time, that’s terrific. This is the granddaddy of them all. Google robots don’t have credit cards. They can’t buy your product or service. Instead of trying to serve Google, serve the people who will eventually become your customers. Create content that interests them and meets their needs. Make it useful. Make it entertaining. Give it some real time and attention. The audience is where everything good comes from. Google is just one way for that audience to find you. A slightly different version of this post was originally published in September 2014, when Google had just killed the Authorship program. And it might get republished later, when they do something else that causes a collective heart attack. We created a new image, and I wrote a new introduction. After the words “you’re left scrambling to pick up the mess,” the only edits I made were changing the word this to it and adding a quick clarifying phrase in the first point. Why do I point this out? Because nothing’s changed, and nothing is likely to change. Google is going to shift. Sometimes abruptly. That doesn’t mean you need to go along for the ride. Develop a sustainable approach, and leave the panic attacks and the dysfunction behind. Sonia Simone is co-founder and Chief Content Officer of Copyblogger. She writes about content marketing strategy here, and about creativity, the craft of writing, and creative productivity at Remarkable Communication. If you like audio content, you can hear Sonia's takes on marketing and business on the Copyblogger FM podcast.